“His entire life till now has only been about going from one hospital to another, getting one blood test after another, and numerous rounds of painful chemotherapy. 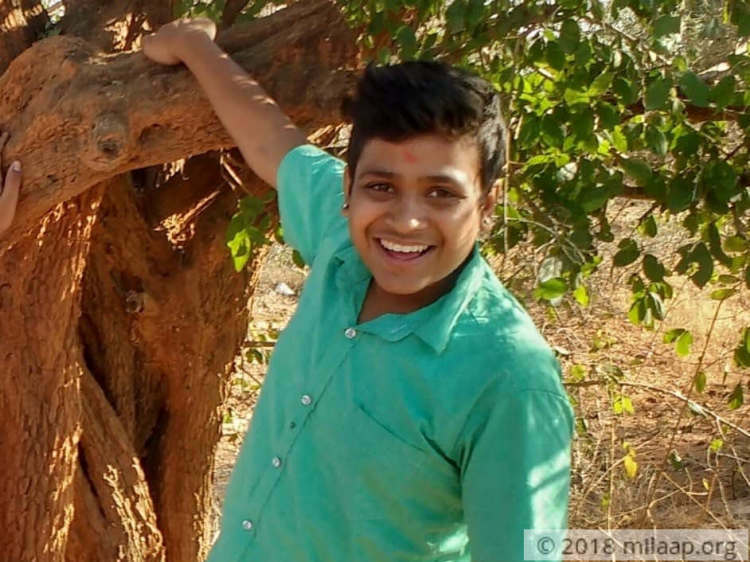 He should’ve been in class 10 now, but he was forced to drop out of school so many times that he hasn’t even started class 8. Cancer has taken away every little joy in his life. He begs us to take away the pain, but I’m more helpless now than ever.” - Srinivas, Chidananad's father. 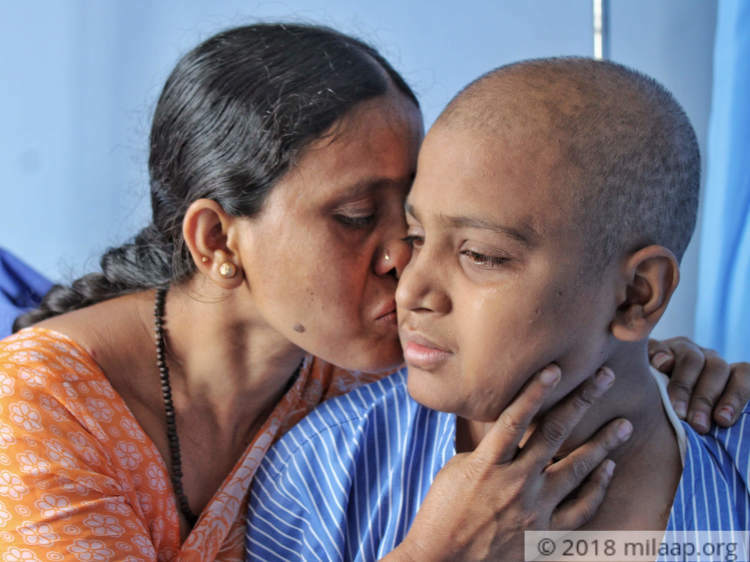 When 15-year-old Chidananad looks back at his childhood, all he can remember is the many times he’s been pricked with needles. Now, Chidananad knows he has cancer and death stares him in the face. All he asks his parents is to be free from this pain. "Appa, I want to go to college. I want to grow up. I don’t want to live with this anymore," he begs. But Chidananad will only survive with a bone marrow transplant. Unfortunately, years of medical expenses have left Srinivas and Renuka neck deep in debts and completely helpless. 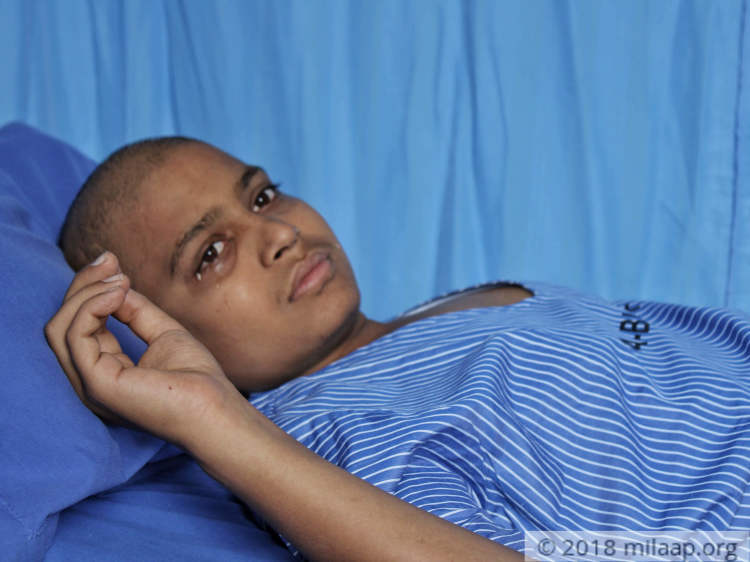 Three months ago, Chidananad woke up to a very high fever, but this was no ordinary fever. The last time he had felt like this was five years ago, and he knew that something was wrong. Even on the way to the hospital, Renuka and Srinivas hoped with all their hearts that his cancer wasn’t back. Unfortunately for their son, blood cancer was back, deadlier than ever. Chidananad started chemotherapy two months ago, but it’s not enough to save him. 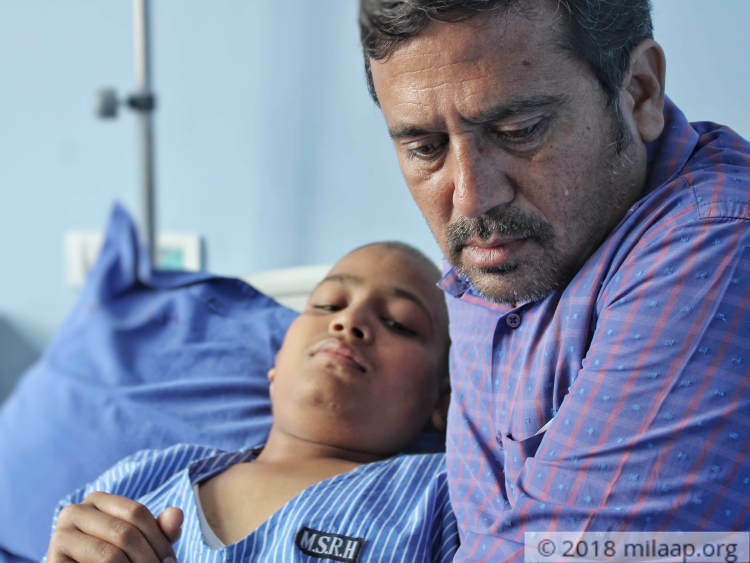 He needs an urgent bone marrow transplant to beat cancer once and for all. This is his only chance, and his parents are desperate to do everything they can, but they’re falling short. Srinivas works as a helper in an office in Bangalore, but years of medical expenses have left him with nothing. Srinivas has no way to afford 25 lakhs for the life-saving transplant. 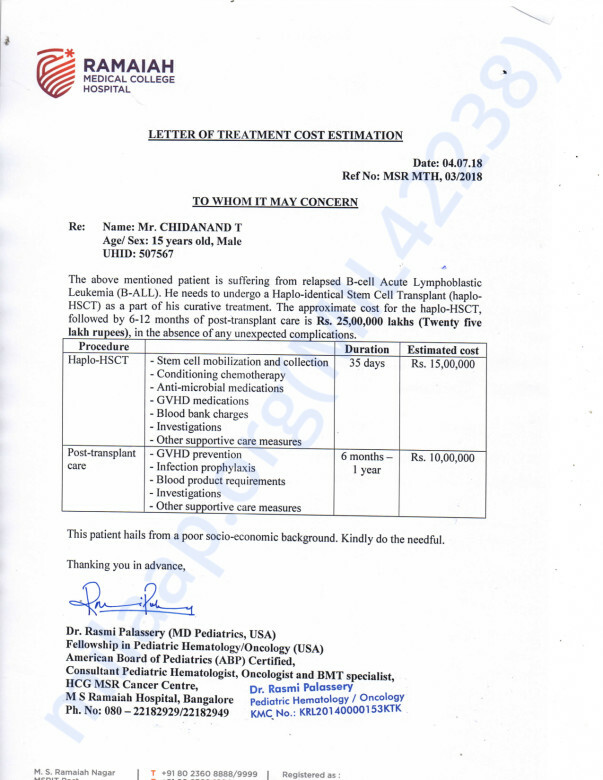 Chidananad needs an urgent bone marrow transplant to beat blood cancer. He’s been undergoing chemotherapy for the past two months, but it’s not enough to save his life. His cancer is deadlier than ever and only timely treatment can ensure Chidananad lives to see a future. His parents have exhausted everything they had. They need your help to finally save their son from cancer. Chidanada is doing well. He is under post BMT follow up. He is recovering and is responding well to the treatment. Chidananda is under post BMT supportive care. He is currently at home and is doing well. He comes for his weekly Follow up to the hospital. Here's a quick update on Chidananad. Chidananad is under post BMT supportive care and keep doing well. He needs to go for various blood investigation and medications to track the disease condition. Thank you once again. Keep praying for his speedy recovery.